Legendary skincare name Aesop opened its first New Zealand store last year in Newmarket, Auckland, and I for one could not have been happier. I make frequent visits just for a gander and a sniff (not creepy, promise!) and have several of their products on my wish list pretty much all year round. I love the fact that Aesop manages to be both beautiful and practical, a hybrid of old school and new tech disciplines, and they don’t release products in a gung ho style at all. Each creation has been researched and tested until perfection is attained, and their legions of fans around the world are testament to the fact that the brand truly does get things right. One of their most popular ranges is the Parsley Seed collection of products, each of which were designed to perform to the highest standard. They can be used together or in combination with other classics from the Aesop range, and they smell delicious. The Parsley Seed Facial Cleanser is a richly foaming formulation that removes surface impurities and offers mild exfoliation using Lactic Acid, whilst the Parsley Seed Anti-Oxidant Facial Toner – one of my top picks for the summer months - soothes and balances skin and prepares it for hydration. 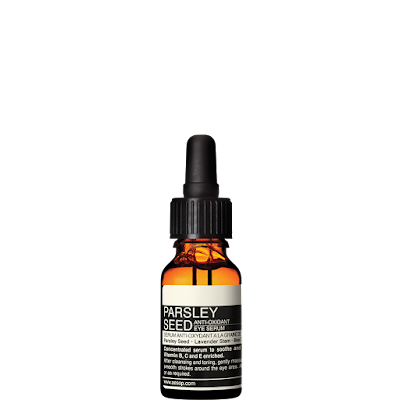 There is also a Parsley Seed Anti-Oxidant Serum to hydrate, soften and fortify skin, and the Parsley Seed Anti-Oxidant Eye Serum that I’m going to talk about today. Although I like my eye products to be high performance I don’t like them to be heavy, finding that thick creams and whatnot end up giving me milia and irritating my contact lenses on those days when I swap out my glasses for a few hours. Thus, the idea of an eye serum is very attractive to me, and the potent parsley seed-based number from Aesop is a little wonder. Although its super lightweight to the touch, the vitamin-rich serum delivers targeted hydration and nourishment from concentrated fortifying anti-oxidants and fatty acids to the delicate skin surrounding the eyes. It smells pleasantly herby like many of Aesop’s products, and the dropper dispenser means that things stay pristine and bacteria free, which is always a win for me. A little also goes a long way, and I find the best way to apply it is by putting two or three drops on the back of my hand first, then lightly tapping it around the eye area with my ring finger. Too easy! You can use this baby morning and evening or as often as you like really – I find a drop dabbed in mid-afternoon brightens up the under eye area and softens any concealer like a charm, too. So there you have it! This beauty is in store now with an RRP of $90.00.